Hunting down the Climate Talks shuttle bus in Krakow one morning, we met Tunga from Nepal. “The snows are coming early in the Himalayas,” he told us as we boarded the bus and sat at the back. Springs are too warm and peach crops are falling from the trees, unripe. 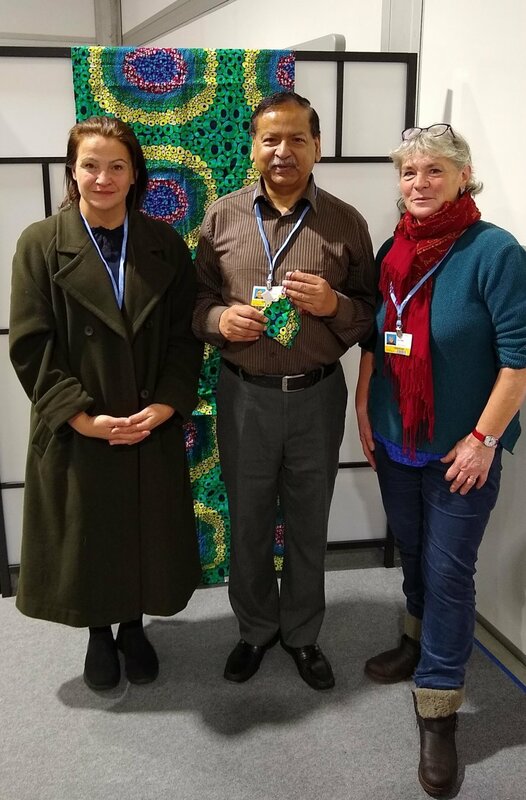 Tunga, from the Indigenous People’s Alliance was attending the 24th UN ‘Conference of the Parties’ Climate Talks – known as COP – where, in a planetary inversion, the winter’s snow was refusing to fall. Shelley Castle and I travelled there as artists with Encounters’ Walking Forest for a singular, simple purpose: to gift to people the seed of a tree planted by a Suffragette, Rose Lamartine Yates from the Suffragette Arboretum at Batheaston in England. Planted over 100 years ago, Rose’s tree, a magnificent Austrian Pine – which with care, could live another 400 years – is now the last standing tree: all others were demolished to build a housing estate in the 1960s. 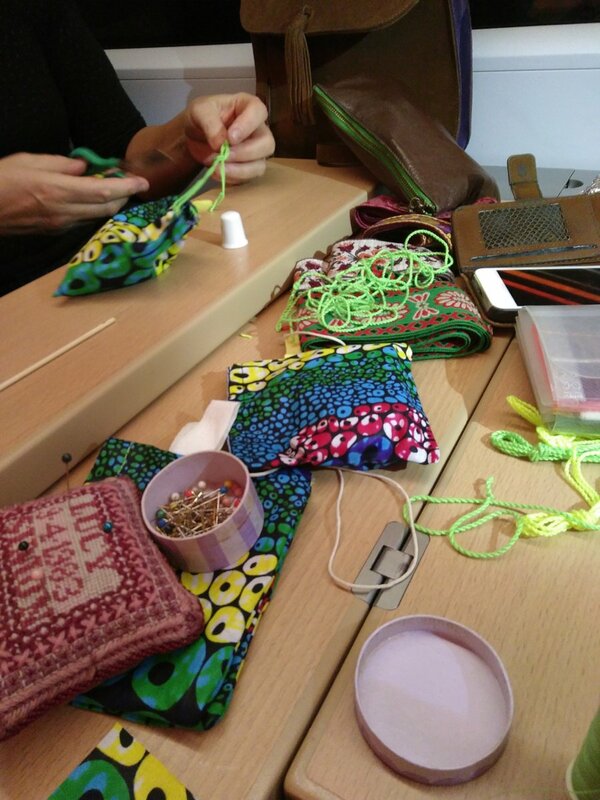 Travelling overland to Katowice for two and a half days, Shelley and I domesticated train carriages with coloured fabrics, thread and scissors to stitch seed gift bags, sewing name labels in for as yet unknown recipients. They could be added once we’d found and identified them. A ‘COP’ is an intense, intricate, massively complex human affair. Over 30,000 people beetle away to adjust the narrative dominating every waking, sleeping moment of all life on Earth: humans have overreached themselves and are responsible for bringing about the 6th Mass Extinction, global warming and an array of social and ecological injustices beyond belief. The COP site is neonlit and vast. Negotiators from 200 countries sit side by side at desks ‘operationalising’ the ‘Rule Book’ from the 2015 Paris Climate Agreement, weighing up, energy efficiency, emissions reduction, economic development and reforestation. Like detectives in a parallel universe, we were on a mycelium mission to cut across paths of those we met, inviting them to connect quietly to a small seed. 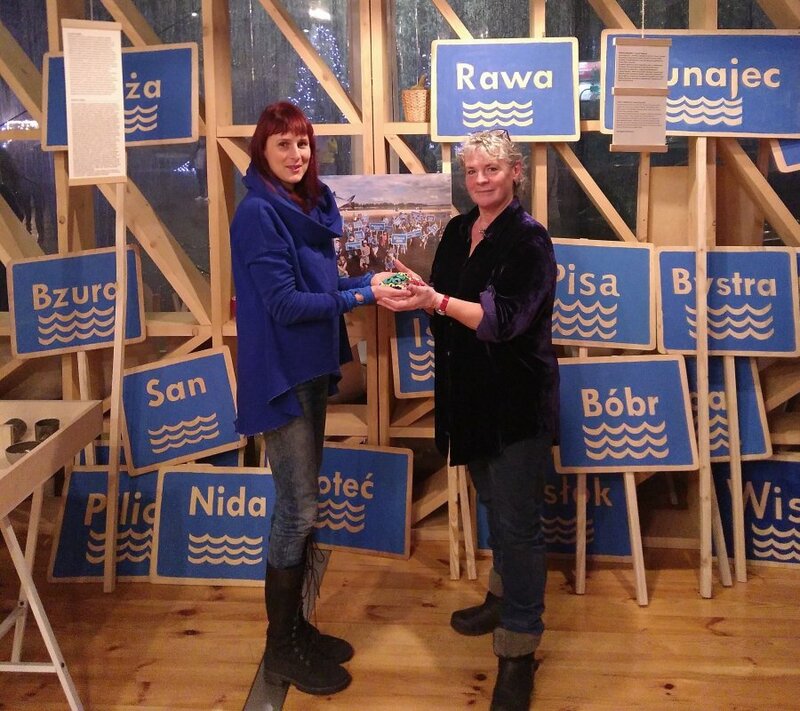 Amongst the throngs, we gently intervened in 14 people’s busy COP24 trajectories: 11 women and 3 men. Lawyers, faith leaders, activists, negotiators, ministers and artists. We told the story of Rose the Suffragette and her tree. 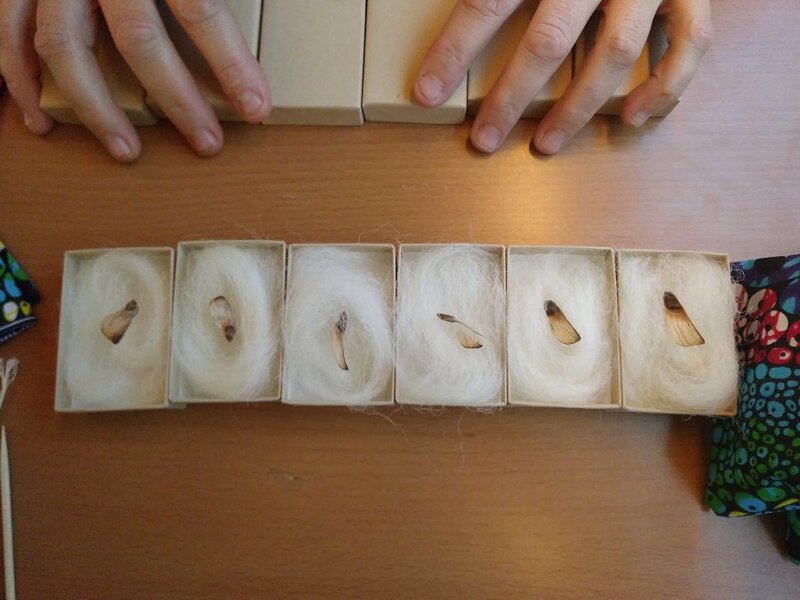 We asked people to close their eyes and hold out hands into which we placed the seed. Something quite precise shifted in our moment of encounter, as though the air slowed down, settled and clarified. Bringing onto the vast COP venue, a seed from the natural world, with an immense and significant history, we made space for stillness, connection, radical hope and heart. In the quiet exchange there was warmth, love, pain, grace, vulnerability, softness, resilience and childlikeness. We felt deep gratitude for the work our ‘giftees’ were doing there, whilst acknowledging grief for the need of it. “It’s like homeopathy,” Shelley said. A system orienting to health. In a handful of minutes, we apprehended the weight of care they carried. Achala Abeysinghe is lawyer for the ‘Least Developed Countries’, 1 billion people in all; Dr Saleem Huq trains negotiators for the same 48 countries. 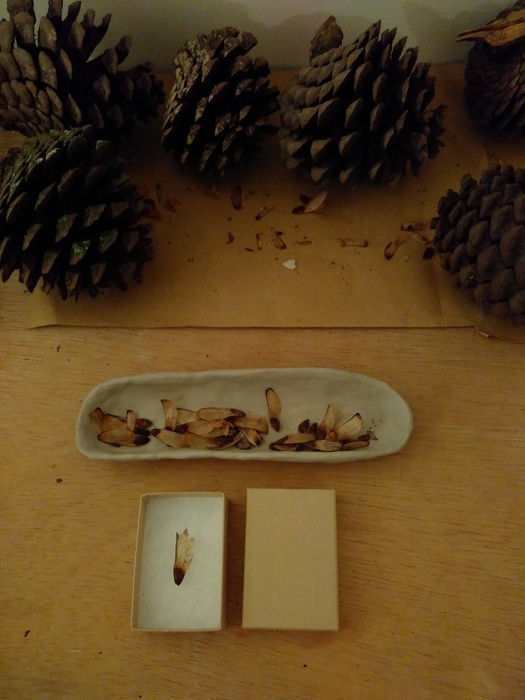 Our action, in contrast, felt weightless, as though the seed was doing all the work: handing back to people their own emotional strength, courage and trust in nature’s potential for restoration and renewal. 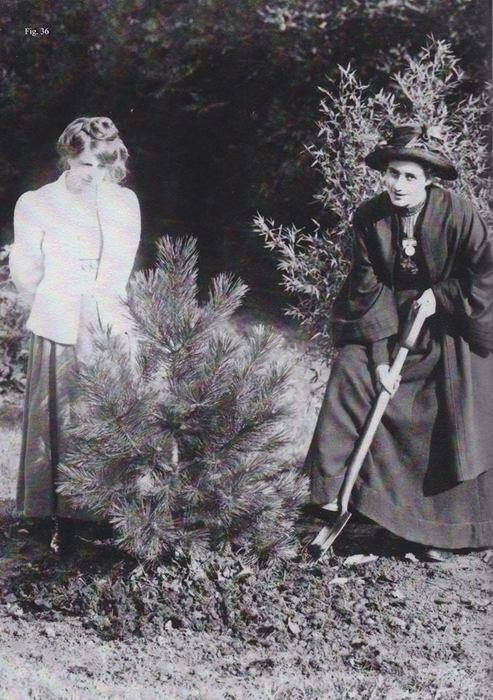 Rose’s intention in planting the tree – she was imprisoned in Holloway prison for her Suffragette actions, leaving her 8 month old son with her husband – was to bring about a change in the way women were represented in the political system. Walking Forest brings the natural world into the political frame where suffragettes placed women 100 years earlier. 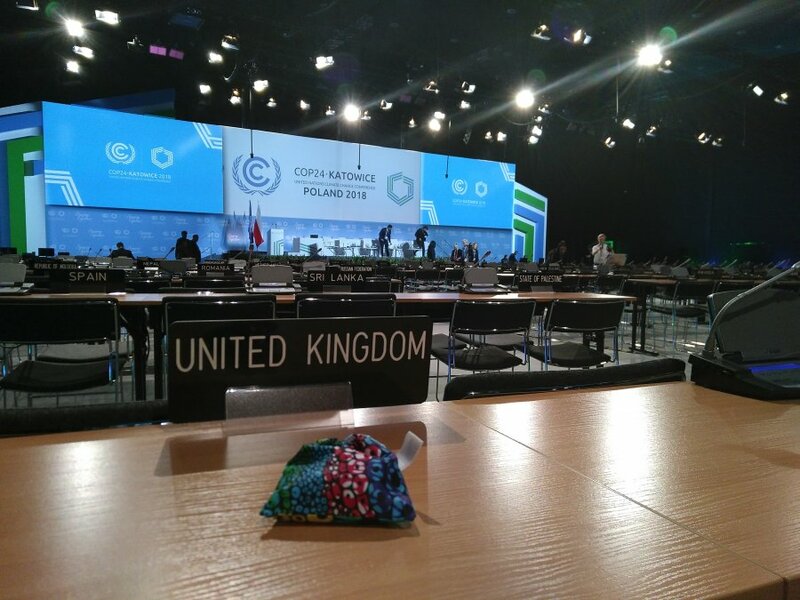 We draw inspiration from the hidden world beneath the forest floor; creative movements of resistance and change making, surprisingly in evidence at COP – especially amongst women and children, like the 15 year old activist Greta Thunberg who spoke at COP24, making their voices heard. On the last day, we heard a baby crying. The mother, Isabel Cavelier Adarve from The Independent Association of Latin America and the Caribbean, was introduced to us minutes later by Farhana Yamin, an environmental lawyer and experienced COP negotiator, now active in Extinction Rebellion – she herself gifted a seed days later to Patricia Espinosa, UN Executive Secretary. Meanwhile, next to the potted plant by Information Desk in Zone B, Shelley and I gifted Isabel a seed. She asked us to inscribe her daughter’s name Gabriella from Colombia on the seed’s label. We return emboldened. The seed is tiny, its possibilities are immense. As is the role of maker, creator, artist and designer at this extraordinary moment in the Earth’s story. Trickster-like, we cut across existing paths to disrupt and surprise, opening space to connect differently. The UK has lodged the request to host COP in the UK in 2020. We anticipate artists, activists, trees, women and children, playing their part in how we bind – and gift – ourselves to the restoration of a liveable world.